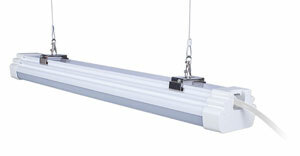 The UL-rated fixture comes with a 5-year warranty. Mounting accessories are included, saving the installer both time and money on getting the mounting parts. The fixture can also be daisy-chained thus simplifying the wiring task. The default color temperature is 5000K. Other colors are made to order. Click here to download the cutsheet. For more, please email [email protected] or call us at 425-430-4555.